For just about his entire life, Ron Smith has been a subject of a scientific inquiry. At birth, in 1972, he was studied by scientists, and then assessed again at age three to document his physical fitness, mental health and intelligence. Every few years after that, he has returned to be poked, prodded and tested in the name of science. This year, Smith will turn 45. Now, this detailed catalogue of biological data is helping researchers answer one of the most perplexing scientific questions of all time: Why do some of us age gracefully, while others find that their bodies begin an inelegant process of failure long before death? Where Smith is from, a life under the microscope is not unusual. In fact, most of the people he went to high school with are lab rats, too. Unless you share an enthusiasm for either the great royal albatross or gold mining history, it’s unlikely that you’ve ever heard of his hometown, Dunedin, a university town of 127,000 that occupies the bulging southern tip of New Zealand’s South Island. But since 1972, researchers here have been studying more than 1,000 babies born over a year-long period at the city’s Queen Mary Hospital. Over 45 years, the research had yielded important insights into things like what leads to substance abuse and how early childhood experiences can shape adult life. One finding from the study helped determine the US Supreme Court ruling that a juvenile cannot be sentenced to death. Now, wielding a treasure trove of data spanning decades, they have shifted gears to investigate how and why we age. Approaching his 45th birthday, Smith, whose name we’ve changed because the study does not give out information about participants, was called back home to Dunedin for yet another round of tests. He is now a scientist himself, married with two kids and living in North America. Over a grueling two days, researchers measured his cardiovascular health, respiratory health, cognition, mental health and oral health. They performed blood tests, MRI scans and asked him questions about major events over the last few years of his life. Over the years, researchers at Dunedin’s University of Otago have collected reams of intimate, detailed data about Smith’s life. “It makes you really deeply reflect,” he told Gizmodo. Decades since it began, the study has resulted in a rare biological snapshot of 1,000 adults from cradle to grays, a vivid picture of what happens to the mind and body as it ages. For a long time, we have understood impressively little about how the body ages. Hippocrates, for one, theorized that the body had a life-giving “innate moisture” that over time dissipated just as an oil lamp might run out of fuel. The early 20th century scientist Élie Metchnikoff hypothesized that aging is caused by toxic bacteria in the gut, and so to stave it off he drank sour milk every day until eventually keeling over at the decently old age of 71. And up until recently, we still mostly thought of late-life diseases such as heart disease, diabetes, and cancer as separate from age. Today, we live longer lives than ever, but many of us suffer from later years plagued by dementia and disease. Recently, transhumanism, genetics, aging global populations and Silicon Valley eclecticism has resulted in a boom in research seeking to slow the march of biological time. Nearly every discovery in human biology has come with a new theory about aging—and, inevitably, how to stop it. Death may be inescapable culmination of life, but damn if we aren’t going to die trying to fight it. By the 1970s, the modern wave of aging science was just gaining steam. Research was still stuck on elementary inquiries like whether exercise could help you age better, but at least scientists were beginning to ask the right questions. In 1972, it’s safe to say, researchers on the Dunedin Study were not dreaming of one day finding a cure for life’s long, slow decline. They were instead interested in the health problems of three-year-olds. But the funding kept coming, and the research continued on as the study’s participants grew up, left home and moved around the world. “As our cohort entered midlife, we came to view our new niche as the process of aging,” Richie Poulton, the Dunedin Study’s longtime director, told Gizmodo on a visit to his cluttered office in a small satellite building of the university that also houses the rugby team offices late last year. The study changed course and set out on a new mission. First, they would figure out who among the study’s 1,000 participants has aged the best and the worst. Then they would figure out why. For Poulton and his colleagues, the real impetus behind the work isn’t to help Silicon Valley billionaires live to 125. Declining fertility rates, aging of the baby-boomers and increasing life expectancy are leading to aging populations that are putting strain on government systems. If people could grow old without their health declining quite so much, it would be a major boon for the bottom line of governments everywhere. This is part of why the study of a small town in New Zealand has received more than $12.5 million in research dollars from governments outside New Zealand, including the US. Lis Nielsen, the head of the Individual Behavioral Processes Branch at the National Institutes of Aging in the US, said that the agency has a particular interest in research that highlights the events that determine how people age. She pointed to one recent study that found childhood adversity was associated with short telomeres later in life, a biomarker for aging, and another that found childhood trauma was associated with increased inflammation at older ages. 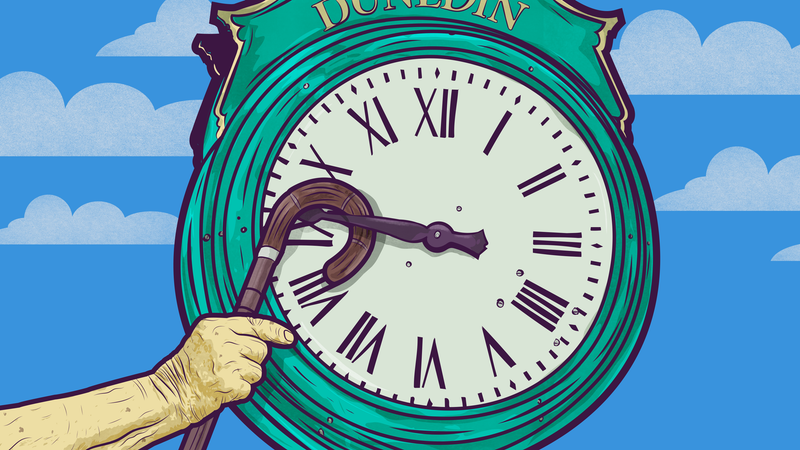 The Dunedin Study is not the first to investigate aging over time. Recognizing that aging populations are a powerful economic force that command significant government resources, governments everywhere from India to Holland have invested in longitudinal studies that seek similarly to track the health and welfare of populations as they age. Still, most of those studies don’t even begin until their participants are well into middle age, if not older—in other words, once their bodies have already started to decline. But aging is a lifelong process. It begins the day you are born. For any therapy to effectively stave off the wretch of time, many suspect we will have to start addressing aging issues long before two glasses of wine start giving you a hangover. Things that happen to you as a teen or a toddler also impact how well you’ll age later on. We’re likely still a long way from therapies that truly slow the effects of time, but the Dunedin Study may provide crucial clues as to what strategies may work best. Right now, the startup Unity Biotechnology is making drugs to eliminate the senescent cells that stop producing new tissues and seem to spread inflammation throughout the body as it ages. The Google-backed Calico is tracking a thousand mice from birth to death to try to determine “biomarkers” of aging. Others are targeting telomeres, trying to lengthen them on the theory that long telomeres protect cells from aging. The prominent geneticist George Church and his team at Harvard have identified forty-five gene variants culled from super centenarians as well as yeast, worms, flies and other animals that may be responsible for extra long lives. But because we still don’t understand the basic mechanisms of which parts of the body spur aging or why, most therapies targeting aging are, essentially, shooting blind. It’s tough to know all of the factors that might play into speeding up or slowing down aging if you don’t start tracking those things when a person is still young. Belsky said that at the root of the aging research is three basic questions: How can the measurements for biological age be used to develop clinical interventions, identifying people who might be aging quickly early on for preventative treatment? What are the roles that genetic, environmental and personal factors play in determining who ages faster? Can measurements of biological aging be used to at last identify the molecular mechanisms of aging? The Dunedin Study is concerned mainly with the last two. In 2015, the study published its first significant aging research, a body of work that looked at participants at age 26, 32 and 38 and found that while most of them aged at a normal pace, accumulating one year’s worth of physiological changes for each chronological year, some aged much faster slower or faster. The “biological” ages of the 38-year-olds ranged from 30 years to nearly 60, based on biomarkers identified in the metabolism, liver, kidneys, cardiovascular system, teeth, immune system, as well as respiratory function, facial aging and telomere length. Some aged as many as three “years” in a single calendar year, exhibiting worse balance, coordination and overall strength than their peers, and already experiencing difficulty with basic everyday tasks like carrying groceries. These fast-aging folks had also already begun to experience cognitive decline. And they also looked significantly older. The study has also begun to shed light how different factors throughout a person’s life affect those rates. In the Dunedin Study, characteristics like economic class, for instance, or whether someone had gone through difficult experiences as a child correlated with how they aged. More than 40% of those who seemed to age at an accelerated pace were also part of a group flagged for “high-risk” personal histories. Other research has similarly suggested that things like drugs, PTSD or even experiencing racism might age us prematurely. But the sheer amount of data in the Dunedin Study, spanning the course of many decades and the entire lives of its participants, makes its dataset especially remarkable. And since its participants are just now reaching middle age, when the body begins to show more physiological signs of decline, it is likely that the data will yield increasingly important insights in the years to come. In the future, Poulton and other researchers plan to test how events earlier in life impact brain functionality later in life, and the the impact those events have on disease and aging. They plan to test how differences in four specific neural hubs impact behaviors that correlate with “successful” aging. And they will measure how these things correlate with biological age, as well as continue to track biomarkers of aging. The study is currently in the midst of its age 45 assessment, which began earlier this year and will finish towards the end of 2017. At the end of that data collection, the researchers hope to have a better understanding of the very complex process of aging, gleaning specific insights into problems like who develops problems like chronic kidney disease and why. “At the end of the day, what we want to do is provide tools to clinicians,” said Belsky. The most important thing about the study, he said, is that they are studying a wide swath of people—nearly everyone born over a calendar year in a New Zealand town—over a long period of time as they simply go on about living their regular lives. “What makes this work so valuable is that our data is not extraordinary in any way,” he said. The Dunedin Study might not be well-known globally, but in New Zealand, it is famous. It was recently the subject of a multi-part documentary series and a museum exhibition. In March, after four decades, it got its own shiny new building on University of Otago’s campus. As the participants age and the data set gets bigger, its scientists expect that the amount of work will expand exponentially. Those scientists have also advocated for other researchers studying aging to begin looking at younger populations for answers. “It is now known that potentially preventable risk exposures and causes of age-related disease begin in early childhood,” they wrote in one paper on the lack of aging studies examining youth. Researchers have also begun to study the children of participants, not only in order to assess parenting skills but to understand how health, behaviors and outlooks translate across generations. When Smith’s eldest son was two, researchers recorded him and his son playing together on camera. Recently, they also began photographing Smith’s face, to track changes in appearance over time. And on the last test, researchers had ditched the usual bike exercises for participants—biking had become too difficult for many of his classmates, so they replaced it with walking. Smith, though, thinks he’s probably average, somewhere in the middle of the pack. “I feel pretty good for my age,” he said.